Many years ago, in the course of some building operations, the Charter-Room at Arniston was dismantled. Its contents, consisting of charters, rent-rolls, leases, accounts, and valuable family papers, were placed on the floor of an attic where, for a long time, they lay in confusion, uncared for, and in constant danger of destruction. 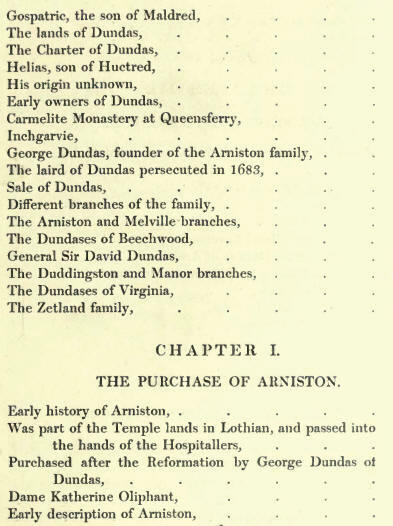 About twenty years ago Dr. William Fraser, who was then beginning those researches which have thrown so much fresh light on the family history of Scotland, was requested by Mr. Dundas to give his help in examining the Arniston papers. Dr. Fraser arranged the charters, making a copious inventory of them, in which everything of local or family interest was described. 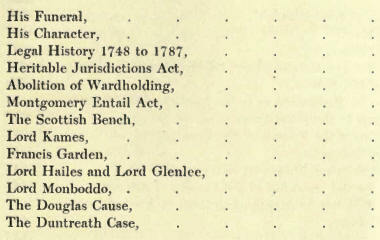 He also deciphered the old estate, family, and colliery accounts down to the middle of the seventeenth century. 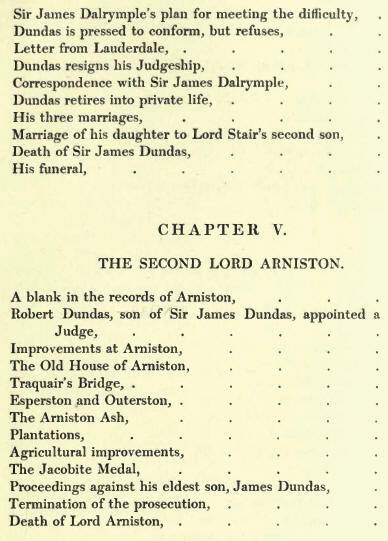 The results of Dr. Fraser's labours suggested the idea of a family history to Mr. Dundas, who accordingly proceeded to arrange the letters and estate accounts, and compile a narrative from them to be left in the Charter-Room at Arniston in manuscript for the private use of the family. 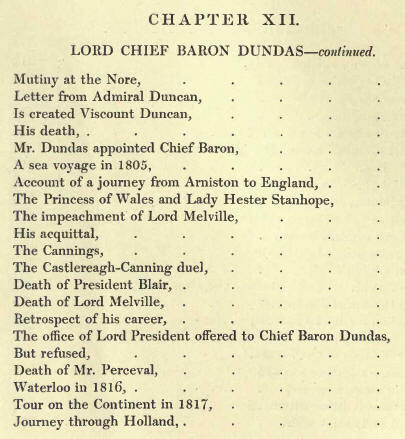 There had been no intention of publication; but friends who had an opportunity of examining the materials thus collected by Mr. Dundas were of opinion that they were worthy of preservation in a more permanent form; and I was requested to undertake the task of weaving them into a continuous narrative and editing the volume of family history which is now published under the name of the Arniston Memoirs. 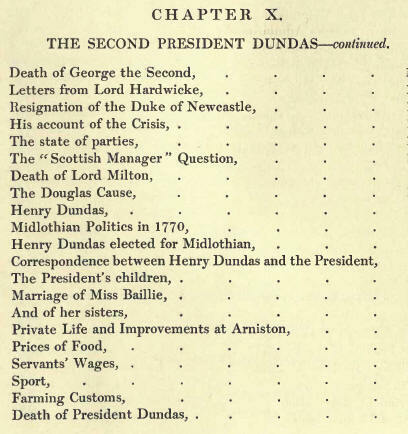 As originally planned, the work included a memoir of Henry Dundas (the celebrated Viscount Melville), who was a younger son of the first President Dundas. 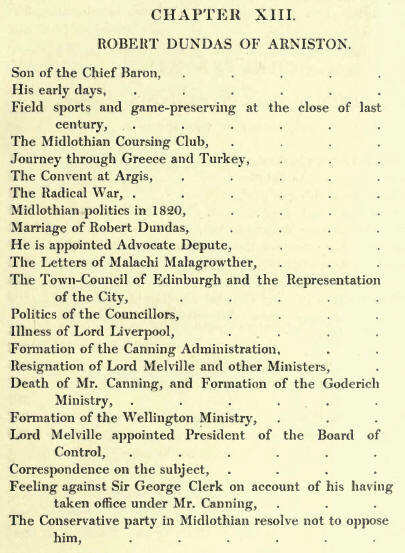 But it became apparent, as the work proceeded, that a complete account of his career, which, in some of its most interesting and important aspects, was that of a British Minister, could not be given without entering upon a variety of subjects inconsistent with the scope of the present volume. 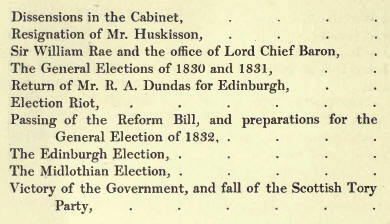 It has, therefore, been decided to omit the correspondence at Arniston between Henry Dundas and his brother and nephew. 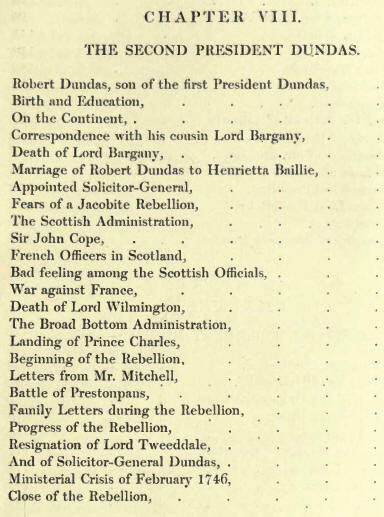 This correspondence, which extends over a large part of his public life, together with the voluminous collection of papers at Melville Castle, will form the groundwork of a separate work on the Life of Henrv Dundas. IN St Andrew Square, Edinburgh, the passer-by may see standing on a lofty pillar the statue of Henry Dundas, first Viscount Melville, the colleague and friend of the younger Pitt. The towering height of the monument is itself emblematic of the lofty position held by Dundas in his native country at the end of the eighteenth century. For many years he exercised in Scotland a sway so absolute that he was nicknamed "Harry the Ninth." The heaven-soaring statue proclaims to the world how great was his position in the eyes of his contemporaries. 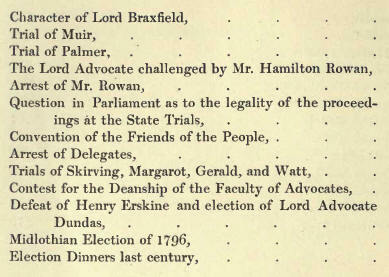 Beginning as Lord Advocate, he filled in a succession of British Governments the most important offices, and played an outstanding part in the history of his time. 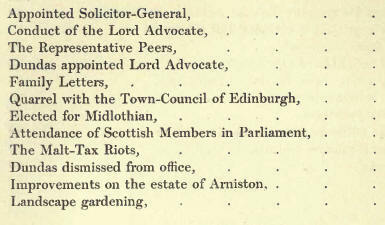 No Scottish lawyer has ever attained an influence or authority equal to that enjoyed by. Dundas. In the days of his greatness, the very streets of Edinburgh, as Sir Walter Scott said, were thought almost too vulgar for him. to walk upon. His word was law; his will was absolute. He was "the Pharos of Scotland," said Lord Cockburn. "Who steered upon him was safe, who disregarded his light was wrecked. It was to his nod that every man owed what he had got, and looked for what he wished." The present writer has been for years an interested student of the work and career of this remarkable man, and he has ventured in the following pages to give some account of his character and surroundings. To tell the complete story of his life is not at present possible, nor is that the object of this sketch. 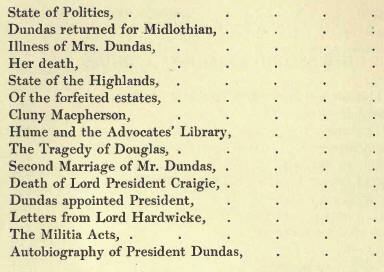 Until the voluminous papers and documents at Melville Castle, the home of Dundas, and at Arniston, in Midlothian, the home of his ancestors, are rendered accessible to research, no biography is possible. 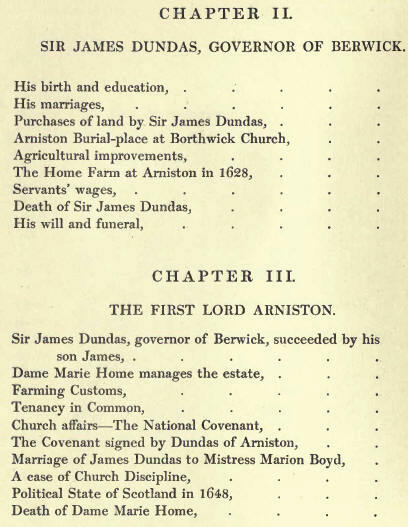 In 1887 Mr George Omond published a history of the family of Dundas of Arniston, and stated that, as originally planned, the work included a memoir of its most distinguished member. 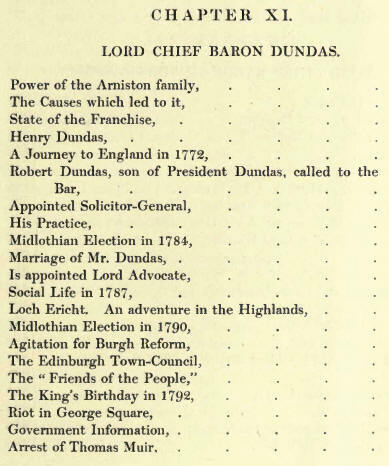 He added, however, that it was afterwards decided to omit his letters at Arniston, and to make them, with the papers at Melville Castle, the groundwork of a separate biography of Dundas. 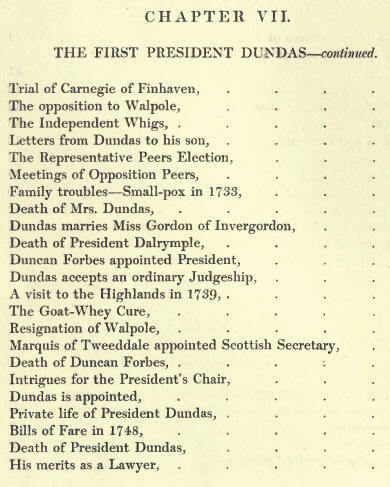 This has never been done and, until those papers and the numerous other documents at the Record Office and elsewhere are examined or published, it would be idle to attempt a complete account of Dundas's career. The object of the writer, therefore, in view of what has been said, is, from the materials now available, to delineate a character rather than to unfold a history; to portray a personality rather than to describe a political career. Even in doing so, he is perhaps writing the truest biography. It has been said that Plutarch is the greatest of biographers, because his object was to make a living portrait of a man's inner nature rather than to write the annals of his external acts. "I am not writing Histories, but Lives," he said. "Very often an action of small note, a short saying, or a jest, shall distinguish a person's real character, more than the greatest sieges, or the most important battles." The aim of the present writer, whether successful or not, is to depict somewhat in the spirit of Plutarch the foremost Scotsman of the eighteenth century. He makes no apology for his work. Everything is of interest that deals with the marvellous galaxy, which sparkled and flourished in that wonderful time. We read in The Young Duke how, when Lord Seymour Temple began a story at White's about Fox and General Fitzpatrick, there was a general retreat, "and the bore," adds the novelist, "as Sir Boyle Roche would say, like the last rose of summer, remains talking to himself." Are there not many of us who would tolerate even bores to-day, if the staple of their talk was stories about Fox and Fitzpatrick and the other statesmen of that brilliant age?